› Author AffiliationsTRIAL REGISTRATION: Retrospective study on complex colorectal polypsISRCTN99658893 at isrctn.com. Background Delayed bleeding is the most common significant complication after piecemeal endoscopic mucosal resection (p-EMR) of large nonpedunculated colorectal polyps (NPCPs). Risk factors for delayed bleeding are incompletely defined. We aimed to determine risk factors for delayed bleeding following p-EMR. Methods Data were analyzed from a prospective tertiary center audit of patients with NPCPs ≥ 20 mm who underwent p-EMR between 2010 and 2012. Patient, polyp, and procedure-related data were collected. Four post p-EMR defect factors were evaluated for interobserver agreement and included in analysis. Delayed bleeding severity was reported in accordance with guidelines. Predictors of bleeding were identified. 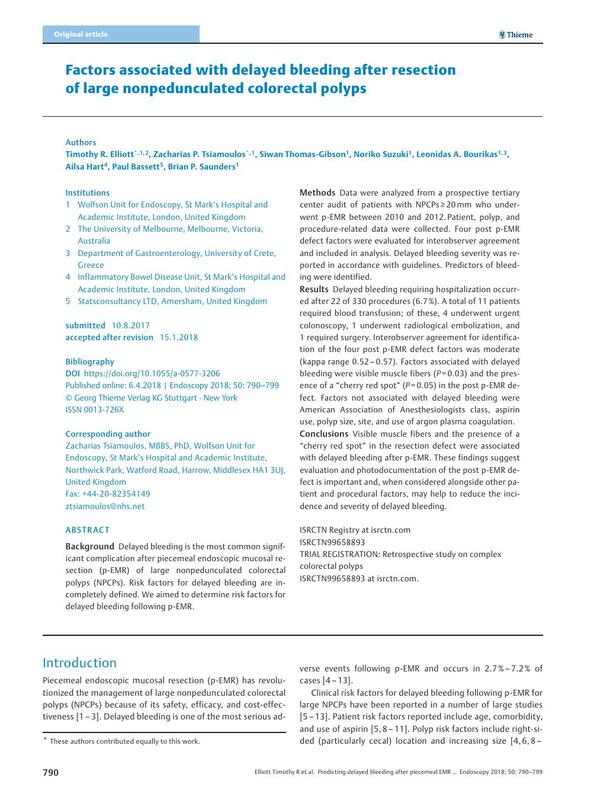 Results Delayed bleeding requiring hospitalization occurred after 22 of 330 procedures (6.7 %). A total of 11 patients required blood transfusion; of these, 4 underwent urgent colonoscopy, 1 underwent radiological embolization, and 1 required surgery. Interobserver agreement for identification of the four post p-EMR defect factors was moderate (kappa range 0.52 – 0.57). Factors associated with delayed bleeding were visible muscle fibers (P = 0.03) and the presence of a “cherry red spot” (P = 0.05) in the post p-EMR defect. Factors not associated with delayed bleeding were American Association of Anesthesiologists class, aspirin use, polyp size, site, and use of argon plasma coagulation. Conclusions Visible muscle fibers and the presence of a “cherry red spot” in the resection defect were associated with delayed bleeding after p-EMR. These findings suggest evaluation and photodocumentation of the post p-EMR defect is important and, when considered alongside other patient and procedural factors, may help to reduce the incidence and severity of delayed bleeding.